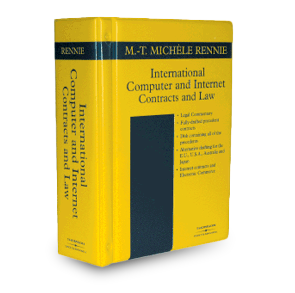 The book, International Computer and Internet Contracts and Law by M-T Michele Rennie, and accompanying disk provides the practitioner with over 90 ready-to-use contracts and licenses drafted by some of the world’s leading experts. Each contract has multi-jurisdictional clauses for use in UK, European Community, USA, China, India, Australia, Japan and on the Internet. The Book’s Commentary offers a comprehensive, definitive but user-friendly analysis of software and database protection in the European Community, USA, China, Japan, Australia, India and on the Internet as well as specific commentary on E-commerce and Digital and Electronic Signatures and Online Dispute Resolution – Soon to include legal AI. Vinay Joy and Ganesh Prasad – with Khaitan & Co. Mumbai and Bangalore. Philip Woolfson (M.A., LL.B) is a partner of Steptoe & Johnson LLP, a US firm of lawyers based in Brussels with its head office in Washington DC. We are told that we shall soon all be passengers on the ‘information superhighway’, caught up in a ‘multi-media revolution.’ However, amidst all the hype remains the fundamental concept that, irrespective of the end results or functions of this technology, there must be an old fashioned contractual relationship between parties who wish to use or exploit it in any way. In addition, to reflect the international nature of information technology, the work also provides a Commentary which goes some of the way to explain the law and practice behind the precedents from the viewpoints of a number of countries. Clearly presented and extremely useful, this will greatly assist the ever increasing band of IT practitioners. The universality in style and content of the contracts included in the publication is intended to reassure the user that the laws relating to computers in general, and intellectual property in particular, have developed and evolved along substantially similar lines in all the jurisdictions represented.